Stem very short, completely enclosed by imbricating leaf-sheaths. Roots many, fleshy, glabrous, compressed, rough, at green-olive tip. Leaves very few to many, (+ of 6 in culture), very robust, fleshy, spread out or arcuately pendent, elliptic-oblong, obtuse, solid green above transversely marbled of pale green or silvery gray when young, later of a more uniform green, carinated and purplished below, long from 20 to 30 cm or more, broad from 9 to 10 cm. Bracts important, clearer than the stalk. obliquely ovate, acute, slightly divergent, the external half of a pure white, sometimes delicately punctuated, the internal half of a pale yellow covered of large purplished points. Petals almost twice broader than the sepals, subrhomboid, very obtuse, of a pure white, sometimes a little punctuated of mauve towards the base.Lip long clawed, almost as long as the sepals, deeply 3-lobed. Lateral lobes fleshy, obliquely obovate-oblong, obtuse, of a yellowish/white punctuated of mauve/purplish. Midlobe of the same color, at cuneate base, then dilated in a limb rhomboid-rounded, narrowed near apex, then dilated again in shape of anchor with two recurvate appendices, broad at their base and subulate at their tip. Callus between lateral lobes in shape of V with on each division a horn-shaped projection. Cylindrical column, with two curved lobes on each side of the stigma. Pedicellate ovary of 4 cm long. Winter flowering or at the beginning of spring. Species close by the foliage to Phalaenopsis schilleriana and certain authors thought that it could be a natural hybrid between this last and Phalaenopsis Aphrodite. This plant pushes very often not far from the sea, sometimes exposed to the spray. One finds it until an altitude of 450 meters. Like Phalaenopsis schilleriana, this plant is able to give flowers with profusion. Discovered in 1881 per Boxall, collector of the house Hugh Low and Co of Clapton in England and named in honor of Stuart Low. At origin, Reichenbach had named this plant according to Boxall then it had reconsidered its idea by dedicating this plant to Stuart Low. 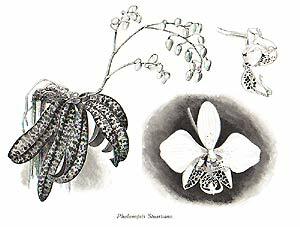 Left : Phalaenopsis stuartiana in 'The Orchid World' november 1915. With lip largely brown on the midlobe. Stripped lateral lobes. Sepals and petals covered more or less of mauve spots whereas the type presents a dorsal sepal and petals pure white. The clone "Larkin Valley", widely diffused belongs to this group. Flowers definitely yellow. Very rare in culture.